New York Raspberry Cheesecake Cookies recipe perfect for Valentine’s Day or any holiday dessert! 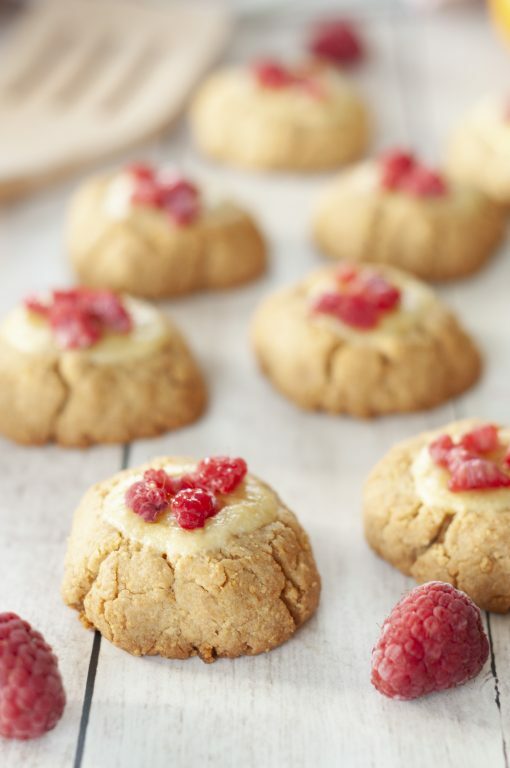 Your favorite dessert made into perfectly balanced sweet and tart cookies with fresh raspberries on top. 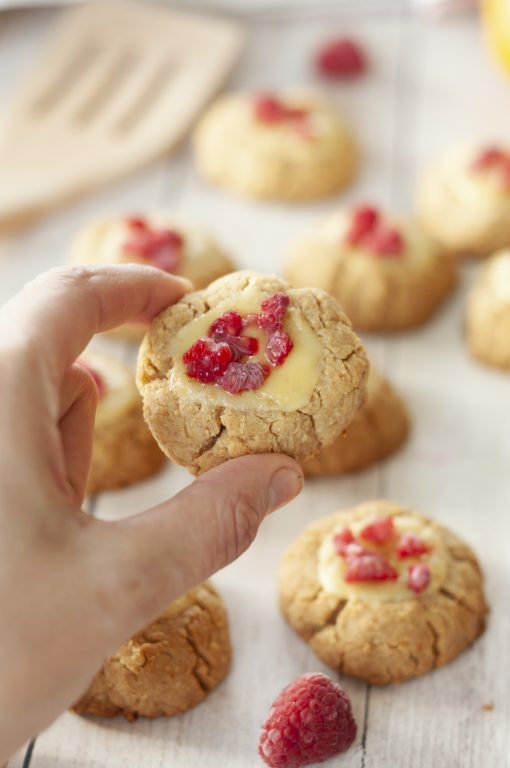 These New York Raspberry Cheesecake Cookies are one of my favorite non-chocolate cookies. When I finally saw a recipe years ago for cheesecake in the form of cookies, I knew I had to try them. I LOVE my Oreo Cheesecake Cookies recipe from years ago. I, of course, couldn’t leave well enough alone and had to jazz them up a little. They just looked like they need a little fun color and contrast in texture added to them. I have to give Mr. Wishes credit because he looked at these cookies in the midst of my pregnancy and doing our kitchen renovation last year and said, “You should put raspberries on top of those!” Pure genius, guys. First of all, I love lemon and raspberry together. Second of all, how pretty are these colors?! Hey, I give credit where credit is due. (If I don’t, I’m absolutely certain to her about it from Mr. Wishes). Fun fact: I remember photographing these being about 8 months pregnant last April and my kitchen being in shambles. I literally put a chalkboard with a vinyl backdrop on top of a toolbox on the floor of a very dusty kitchen, disaster of a kitchen and photographed these beauties. Also, I needed help getting my hugely pregnant self back up off the floor after the fact. Those were the days where just holding my DLSR camera for ten minutes to photograph cookies caused me to be wildly out of breath. Although these are called “cookies”, they are actually not the consistency of cookies. The cookie part is more of a cheesecake crust and is a little crumbly. I just don’t want you to think they are your typical cookie texture, because they definitely are not. They do however have the perfect signature cheesecake texture in the lemon filling. If you are not normally a cheesecake fan because it is so rich, these cookies are perfect. You get the delicious taste of cheesecake without it being too overwhelming. 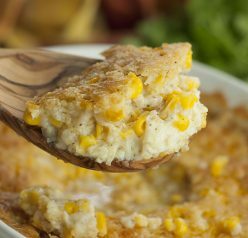 They are moist, sweet, and perfectly tart. If you DO love cheesecake, try this New York-Style Blueberry Cheesecake. I’m totally addicted to these cookies! You can leave out the strawberries or even use another fruit if you would like. I am not usually a “fruit in my dessert” type of person but I think it just really worked with these raspberry cheesecake cookies. They are a new holiday favorite: completely perfect for Christmas, Valentine’s Day and Easter! New York Raspberry Cheesecake Cookies recipe perfect for Valentine's Day or any holiday dessert! 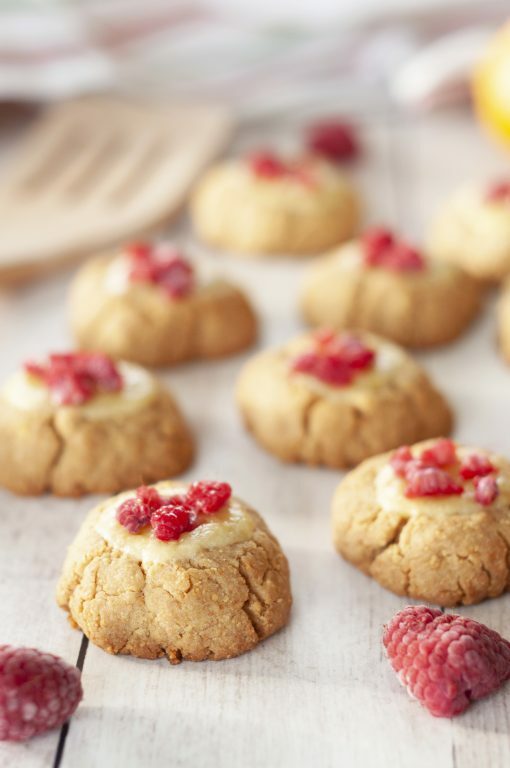 Your favorite dessert made into perfectly balanced sweet and tart cookies with fresh raspberries on top. In a large mixing bowl, stir together the graham cracker crumbs, flour and baking powder. In a medium bowl, beat together the butter with the brown sugar using an electric hand mixer. Add ONE egg and beat until well combined. Add to the graham cracker crumbs and blend just until combined. In a separate medium mixing bowl, beat together the softened cream cheese with the granulated sugar, the other egg, lemon zest and vanilla until well combined. Set aside. 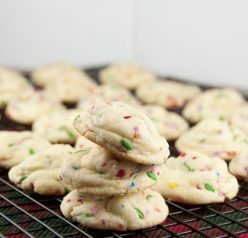 Using a small cookie scoop (about 2 tbsp), scoop out the cookie dough and place on a nonstick or parchment lined baking sheet. 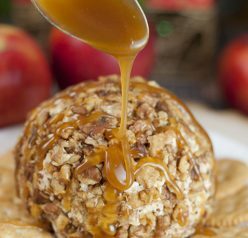 Flatten slightly, pressing your thumb in the center of the ball to create a small bowl shape in the middle of each cookie dough ball. Repeat with the remaining dough. Spoon the cream cheese mixture into the indents in the cookies. Not too much so they don't overflow in oven. Bake until the filling is barely set and the cookies are lightly golden, about 12 minutes. Allow to cool 5 minutes on the baking sheets before removing and cooling completely on a wire rack. Top with cut up raspberries (optional). These cheesecake cookies are genius! I love the flavor combo—I’ll be making these again soon! LOve these cookies. SO YUM! These are such a fun, sweet treat! They are so good! Simply irresistible! These are literally the best cookies ever!